I was having one of those nights, as college students often do, when we just want something warm and a little greasy. 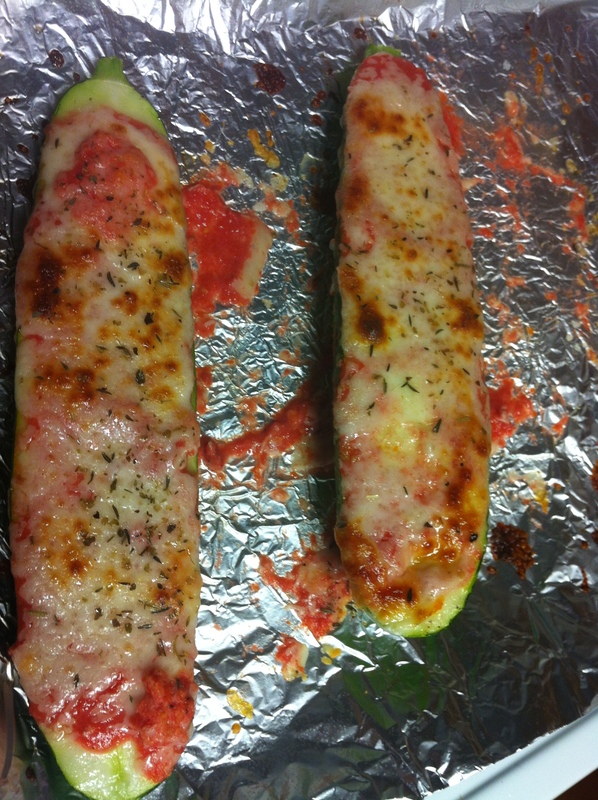 Not wanting to totally indulge, I decided to try zucchini pizza (another reference.) It was much easier and more satisfying than I expected. Obviously, I made what might be considered the zucchini “flatbread” version (I couldn’t find a large, 8-ball shaped zucchini to make the round slices), but it tasted crisp and fresh just the same. For a flavorful meal, this was pretty simple. I had an abundance of of cherry tomatoes, some Italian seasoning and a block of mozzarella cheese just waiting to be used. I keep it pretty simple when it comes to ingredients. Partly because I don’t have the money and partly because it’s just better for you to stick to the basics. Trust me, any recipes I feature on here are not complex. Let’s all remember I’m working with a tiny oven in a miniscule kitchen with minimum counter space. Bottom line: this dish does the trick for a tasty, healthy, fresh dinner. I even had one of the pizzas leftover the next day, and yes, it was just as good. A handful (or about a cup) of cherry tomatoes pureed in a blender with 2 cloves of fresh garlic.